Amazon&apos;s Fire HD 10 tablet serves up access to all the Amazon content you could possibly want, but its clunky form factor, subpar screen, and higher price place it a step behind the smaller Amazon Fire HD 8. The $229.99 (16GB) Fire HD 10 tablet is home to Amazon&apos;s largest screen yet—a 10.1-inch display that&apos;s a window for all of the company&apos;s media content (assuming you have an Amazon Prime membership). In theory, the larger screen should make the Fire HD 10 an even better multimedia consumption device than its smaller sibling, the Fire HD 8. But the larger tablet&apos;s clunky form factor, grainy display, and increased price make the Fire HD 8 the better buy. Amazon&apos;s Fire HD 10 $179.99 at Amazon is identical to the Fire HD 8 in every way, except size. And in this case, those two extra inches of screen make a big difference. The Fire HD 10 measures 10.3 by 6.3 by 0.3 inches (HWD), so it&apos;s both taller and wider than the Fire HD 8 (8.4 by 5 by 0.3 inches). It&apos;s also a little taller, but less wide, than the Samsung Galaxy Tab S2 9.7Best Price at Amazon (9.34 by 6.65 by 0.22 inches). It&apos;s a bit of a strange shape that&apos;s a lot more rectangular than most tablets, and doesn&apos;t make for very good ergonomics, which I&apos;ll discuss in more detail below. 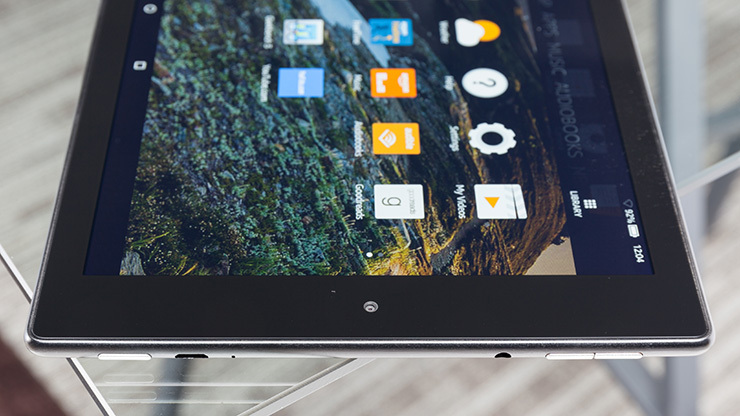 The tablet is available in black or white, as well as a new, classy silver model. All three versions are the same price, though the silver model adds a 64GB storage option for $289.99. Rather than the 8-inch, 1,280-by-800-pixel panel you get on the Fire HD 8, the Fire HD 10 packs a 10.1-inch screen, but with the same resolution. This makes for just 149 pixels per inch, which results in a very grainy image. For a tablet built to consume media, video simply doesn&apos;t look very good on the Fire HD 10. The back of the tablet has a slippery metal finish, which given its heft (15.2 ounces) and shape, proves to be a bit of a problem. It&apos;s not very easy to hold, especially with a single hand. I doubt many people could keep this tablet propped up comfortably in bed to, say, watch a full movie. And it&apos;s hefty, slippery build mean it&apos;s not an ideal companion for your morning commute. The Fire HD 10 comes loaded with Amazon&apos;s latest Android-based operating system, Fire OS 5 Bellini. You can read more about how the Fire OS looks and performs in our Fire HD 8£129.99 at Amazon review. In short, it&apos;s a welcome upgrade with smoother overall performance and more seamless switching between your apps, books, magazines, and movies. The experience here is more user-friendly than with Fire OS 4. Running on a quad-core MediaTek processor that clocks in at 1.5GHz for two cores and 1.2GHz for the other two, and with 1GB of RAM, the Fire HD 10 turned in average performance results. The tablet scored 775 single-core and 1,478 multi-core results on the Geekbench 3 benchmark, which measures overall performance. This lags significantly behind higher-end tablets like the Samsung Galaxy Tab S2 9.7, which scored 1,253 single-core and 4,221 multi-core. Most standard actions run without a hitch on the Fire HD 10, though you&apos;re not going to see the same buttery smooth performance as you will with a pricier, beefier tablet like the Galaxy Tab S2. Playing High Speed Race: Racing Need was fine from a performance perspective, but the tablet&apos;s slippery form factor and ultra-wide screen in landscape mode was a huge distraction during gameplay, and not at all comfortable to hold. Like on the Fire HD 8, the camera here isn&apos;t great: It&apos;s a 5-megapixel shooter that can take a while to focus (up to a few seconds at a time) and produces grainy shots. The long focus time is especially irksome given the tablet&apos;s heft; it&apos;s difficult to hold still for very long. It&apos;s below average as far as tablet cameras go. The 720p front-facing camera is serviceable for video calls. And back to that display. Video playback is a particular problem on the Fire HD 10. While the widescreen aspect ratio should be great for watching movies, the 1,280-by-800 screen is just too grainy. It&apos;s also not particularly good for reading, with noticeably pixelated text. One area the Fire HD 10 outperforms most of the similar-size competition is battery life. The tablet lasted 6 hours and 22 minutes in our rundown test, which streams video over Wi-Fi at full screen brightness. By comparison, the iPad Air 2£287.00 at Amazon lasted 5 hours and 15 minutes, while the Samsung Galaxy Tab S2 9.7 was good for 5 hours and 11 minutes. One notable disappointment: there&apos;s no Mayday video chat tech support here. You can still call Amazon on the phone and a representative can take over your screen (with your permission) to fix a problem or show you what&apos;s wrong, but it&apos;s not quite as convenient as video calling Amazon support right from the tablet like you can with the Kindle Fire HDX 8.9. 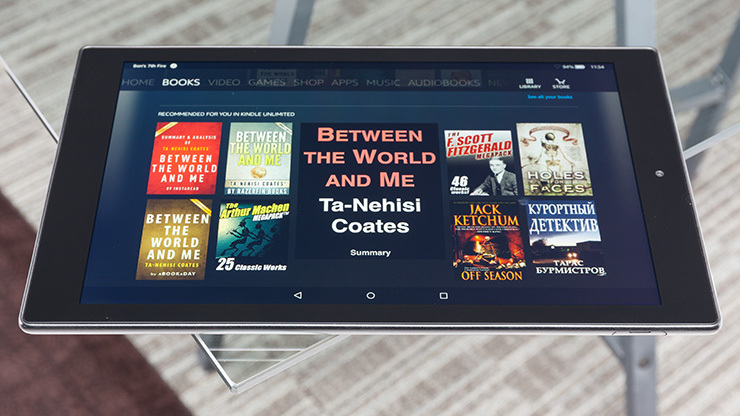 The Amazon Fire HD 10 is a 10.1-inch window to Amazon&apos;s vast multimedia library. Unfortunately, its clunky form factor, slippery back, and grainy screen don&apos;t justify the jump in price over the Fire HD 8, which offers access to the same content but in a much more manageable body. If you&apos;re after a more well-rounded tablet, you&apos;ll have to shell out some extra cash for the iPad Air 2£287.00 at Amazon, which has an unbeatable app experience. The Samsung Galaxy Tab S2 9.7Best Price at Amazon, meanwhile, remains unparalleled for multitasking. Both of these tablets, it should be noted, have better designs and vastly superior screens to the Fire HD 10. And if you&apos;re just looking for a quick and easy Amazon content fix, the Fire HD 8 is a better option. Or, you can hold out for the forthcoming $50 Fire tablet. We haven&apos;t tested it yet, but it&apos;s one of the least expensive tablets available from a notable manufacturer.